Rhymes With Snitch | Celebrity and Entertainment News | : Scott Disick and Sofia Richie Call It Quits? Scott Disick and Sofia Richie Call It Quits? 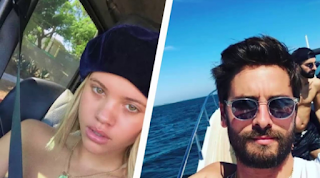 Lionel Richie's 19 year-old daughter Sofia has been dating 34-year-old reality star Scott Disick since last September [click here if you missed that]. Have Scott and Sofia called it quits..? This week fans noticed Scott is no longer following Sofia on social media while his baby mama Kourtney Kardashian, 38, also stopped following her 24 year-old boy toy Younes Bendjima. Sofia was also spotted at various Oscar parties this week with her father, not Scott. sofia is hotter than all the kardashians put together. give her a show.